spillyjane knits: A sneaky peek. But back to the sock! This is a new pattern of mine, which will be released into the wild before Thursday, 20 November 2008, in plenty of time for you to bang out a pair for your holiday knitting. Seriously, it's been a long time since I've knit a sock that was this much fun. I just couldn't put it down, it was that enjoyable. As always, stay tuned for more sock-info. November 13, 2008 at 7:53 p.m.
November 13, 2008 at 11:26 p.m.
August 17, 2009 at 11:30 p.m. 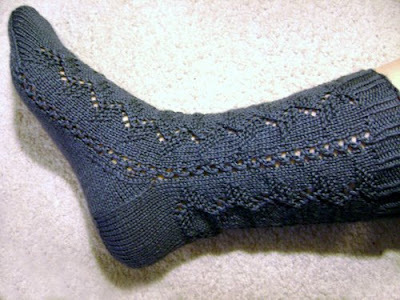 The Penelo sock pattern is ready!